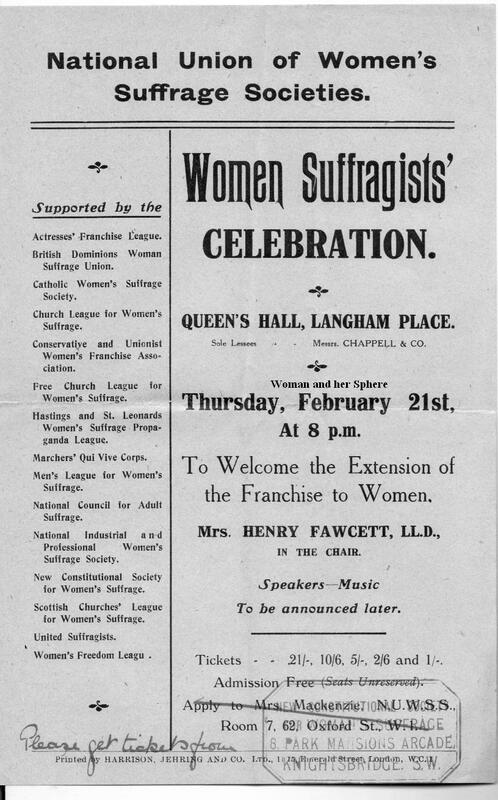 Flyer for the celebrations held at Queen’s Hall, Langham Place on Thursday 21 February 1918 – ‘To Welcome the Extension of the Franchise to Women’. The flyer includes the long list of societies that were taking part – the WSPU was a notable exception. On the list was the New Constitutional Society for Women’s Suffrage – and this flyer bears the annotation in ink ‘Please get tickets from’ followed by the NCWS’s rubber stamp with their address in Knightsbridge. The leaflet is in very good condition and is rather rare. £55 post free. This entry was posted on August 2, 2012, 1:57 pm and is filed under Collecting Suffrage. You can follow any responses to this entry through RSS 2.0. You can leave a response, or trackback from your own site.